Driving past a bright red door, I thought it was a pretty sight. But I didn’t know how important that place was until tour guide Barbara started talking. Having a great tour guide can certainly make traveling more educational and fun. 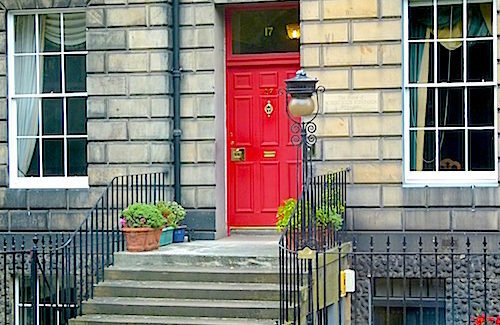 In this case, it was the red door in Edinburgh, Scotland. Barbara pointed out that this was where one of my favorite authors, Robert Louis Stevenson, grew up. A sickly child, Stevenson had a family nurse who would lull him to sleep with spooky stories. One of those tales involved a strange man who had constructed a cabinet located in the child’s room. This weird Edinburgh man, William Brodie, had two lives. In one, he was a respectable craftsman and town council member. In another, he was a criminal – drunkard, gambler and thief. When his double life was discovered, Brodie was hanged on Oct. 1, 1788, in front of a huge crowd.